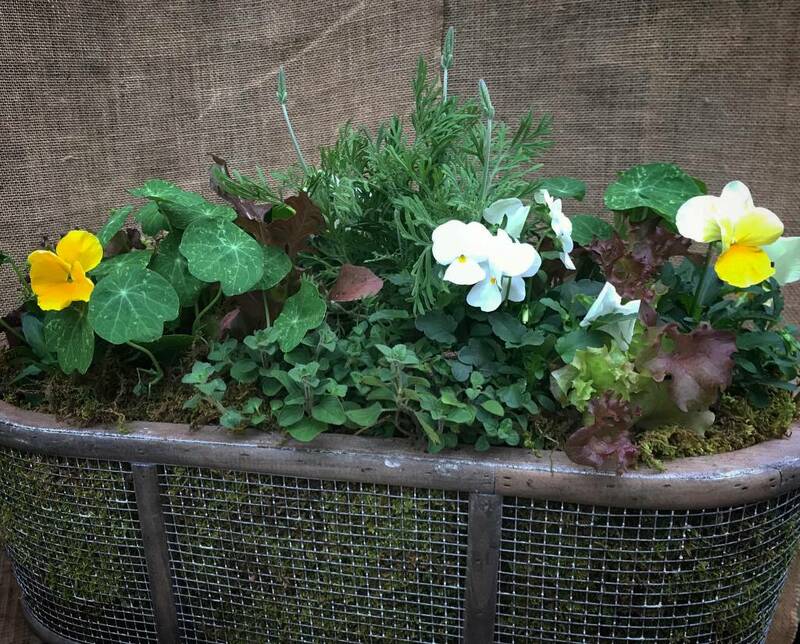 A New Planting Season Brings New Possibilities…Don’t Be Afraid! 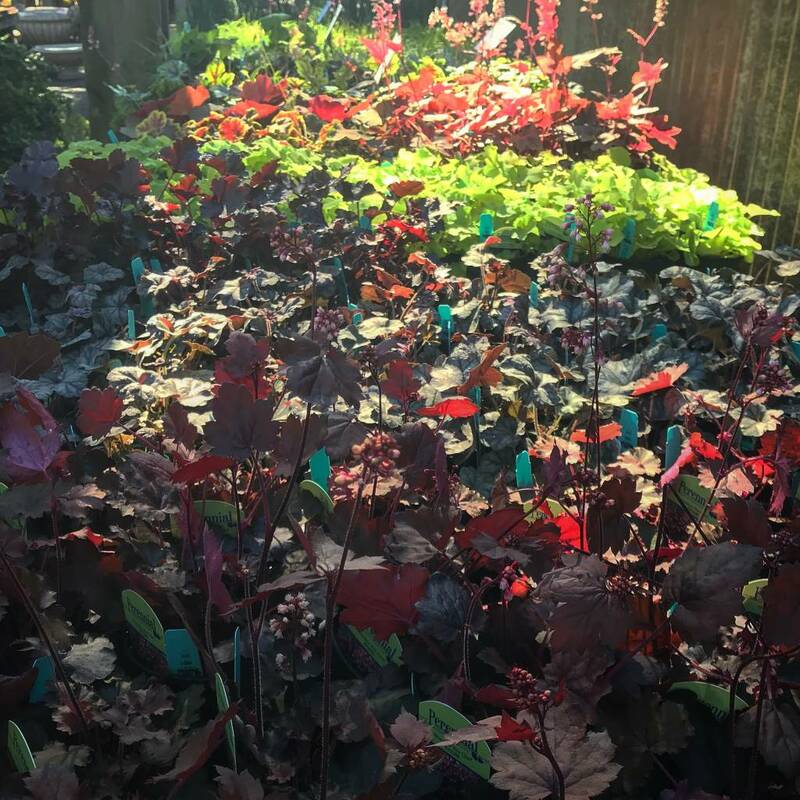 I read a piece that Tony Avent of Plant Delights Nursery wrote a few years ago about some people being “controlling” gardeners while others are “gambling” gardeners. I really thought it was spot on, and I can say I’ve worked with both types. 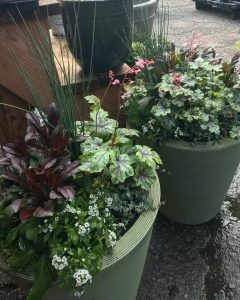 Of course, many of us gamble each year, planting marginally hardy plants that have done fine with our mild winters of past years. Boy, can some winters give us a whammy though! 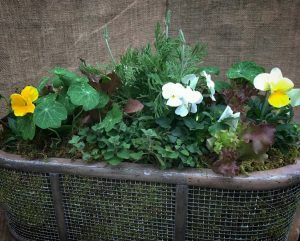 I really liked this comment from Tony Avent, “Controlling folks want everything to work out just as the gardening books say, and struggle when plants don’t do exactly that, while the gamblers take a chance, try new things and hope for the best. For the gamblers if things don’t work out quite as expected, it’s an opportunity for something new, rather than a failure. 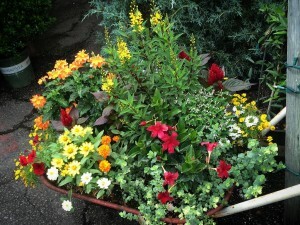 Personally, I like the gamblers approach to gardening much better, and think it causes a lot less anxiety! So, what’s the point? 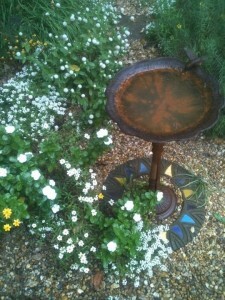 The point is to relax and enjoy gardening, remembering that nature is always in charge. With the beginning of a new planting season, my personal outlook is going to be that of looking on my gardening efforts as a joy and an opportunity to not only beautify my landscape and surroundings but to nourish my soul as well; and, if there are failures, that will be part and parcel of the process. 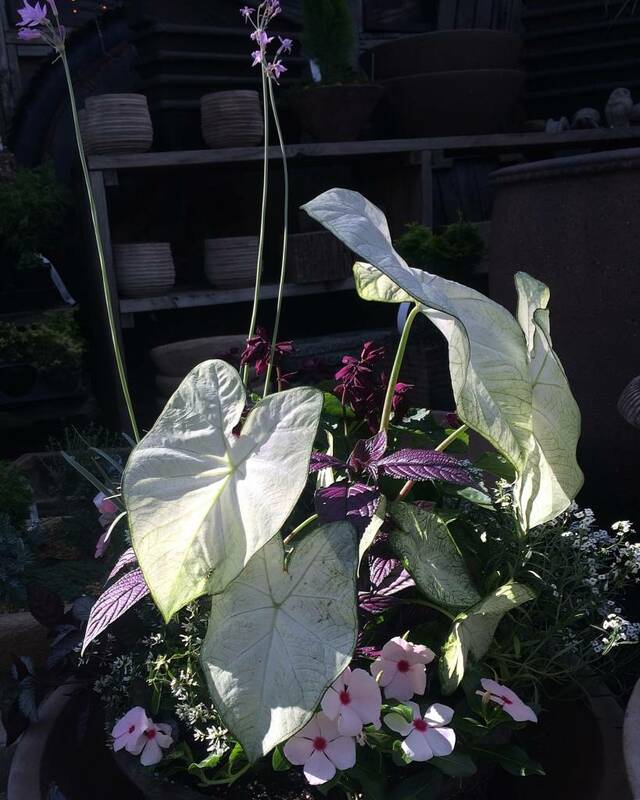 Some of my best plant combinations have been happy accidents! 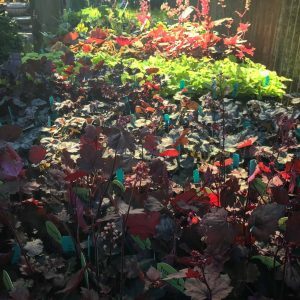 The pictures here are of my garden – plants are allowed to self seed, failures are yanked out, and plants that strike my fancy are tucked in here and there where I think they might look good. It wouldn’t make anyone’s list of a perfectly designed space, but it’s mine and that’s how you should treat yours too. 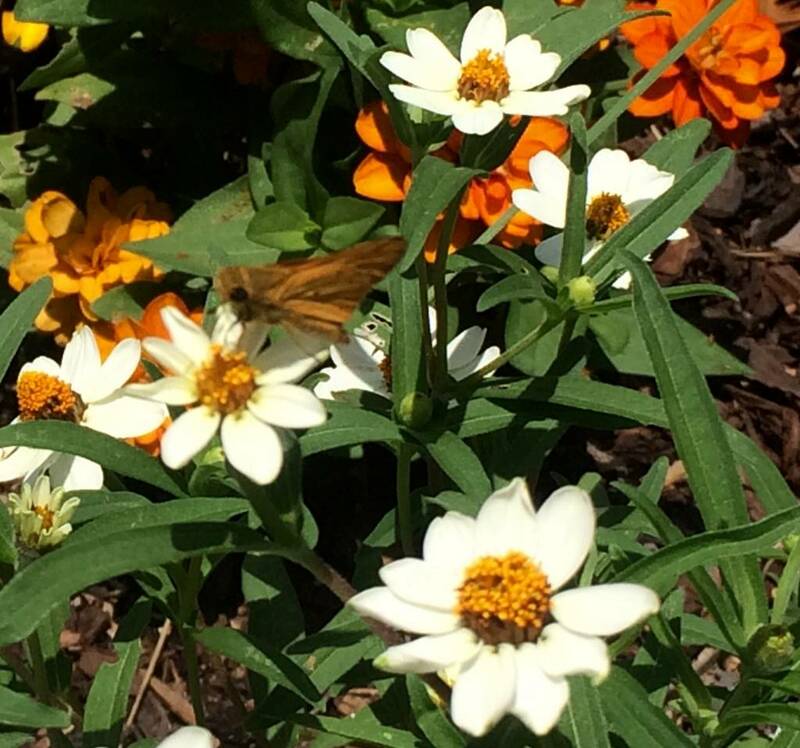 Above all, whatever the outcome of your garden, take time to appreciate the life you bring into it…a butterfly on a zinnia bloom, a hummingbird hovering over a salvia, and bees doing their important work with them of pollinating your flowers and vegetables. My ultimate hope is that many of you adopt the gambler attitude. 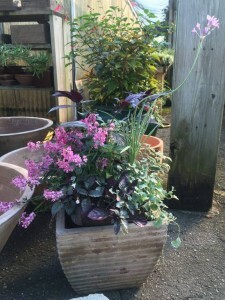 It doesn’t have to be the high roller, high stakes approach, but try to roll with the plant punches, knowing they’ll come, and treat your gardening efforts as what they should be – a relaxing, and therapeutic addition to your daily schedule rather than a chore that’s only done on the weekends. 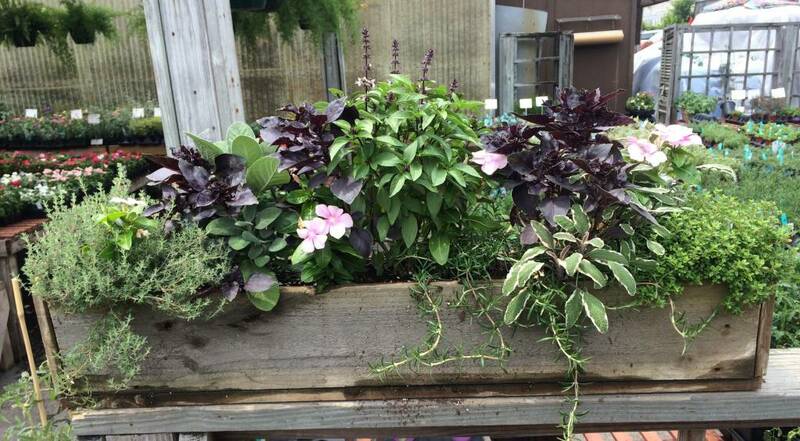 This entry was posted in Annuals, Bedding Plants, Flowers, Herbs, Perennials, Planting Tips, Summer and tagged adding annuals to the garden, adding new plants to the garden, perennial gardening, spring planting, summer planting, tony avent, what to plant for summer on April 9, 2018 by Kris Blevons. 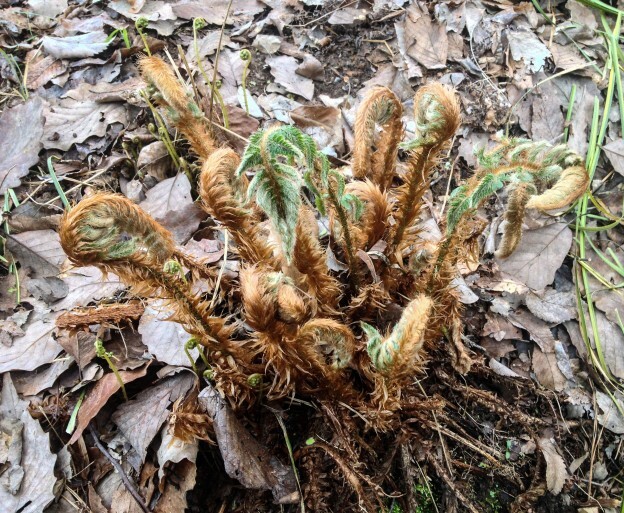 With warm temperatures and sunny days the evergreen ferns in the garden are beginning to unfurl their new fronds. Usually I wait another few weeks before trimming frost damaged leaves, knowing we’re certain to get another cold snap or two. One reason many say to wait before cutting off all the older, winter damaged leaves is that they help protect the emerging fresh foliage from possible freezing temperatures. Usually I listen to this advice; but it was such a pretty day, we’ve had a mild winter, and I really just wanted to get one more chore out of the way while I was thinking about it. Knowing this, I’ll definitely keep an eye on the weather forecasts (Being in the nursery business I’m an avid weather watcher anyway!) 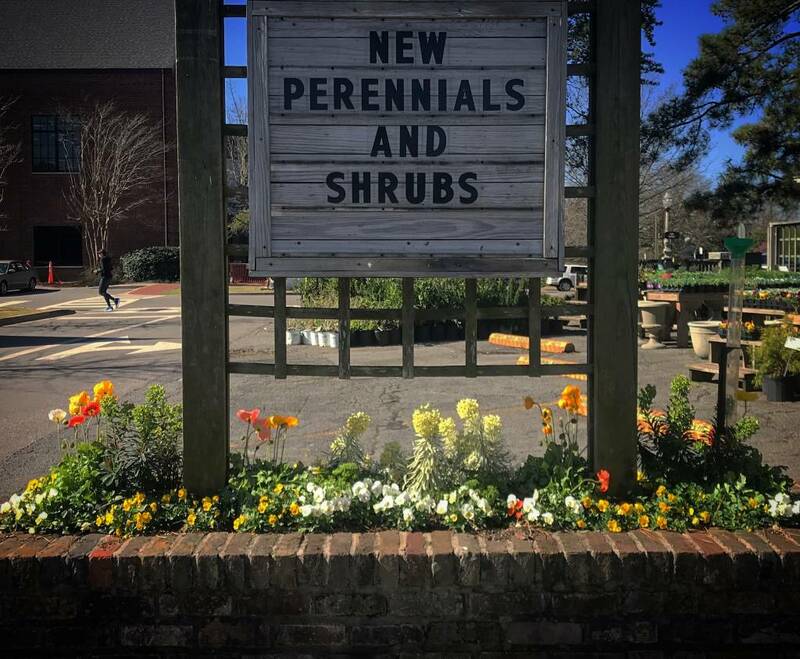 and will be prepared to throw some pinestraw over these plants during any extended periods of below freezing temperatures. It’s certainly possible, since our last average frost is the middle of April. The holly ferns (Cyrtomium falcatum) I decided to clean up are in a protected spot at the edge of a patio area near the house, so they’d be easy to take care of in the event of a freeze. I brought out my folding garden seat and pair of small clippers and got to work. 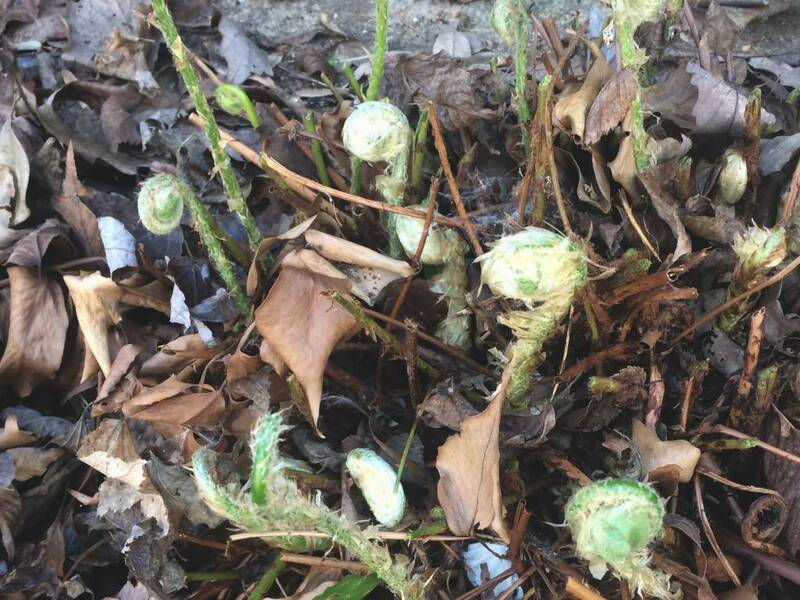 With holly ferns, care needs to be taken doing this so any emerging fern fiddleheads aren’t cut off. 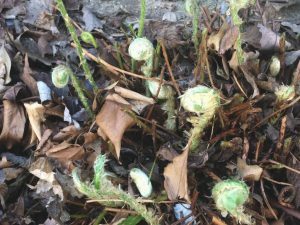 Autumn fern (Dryopteris erythrosora) and tassel ferns (Polystichum polyblepharum) are more cooperative and easier to deal with, as their old fern leaves lie flat on the ground around the crown of the plant and are easy to remove without damaging any new growth. 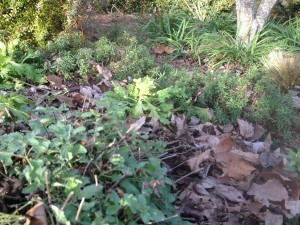 When I was finished, the bed looked pretty naked except for some leaf litter, which I left to help protect the crowns. 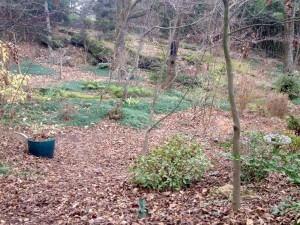 By the end of March I’ll make a final clean up and remulch around these plants. 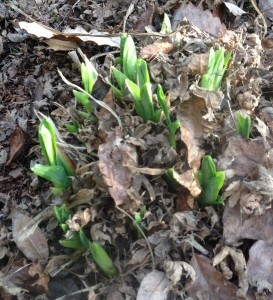 For now though, I’ll enjoy watching the new growth unfurl a little more as each day grows longer on the way to spring. 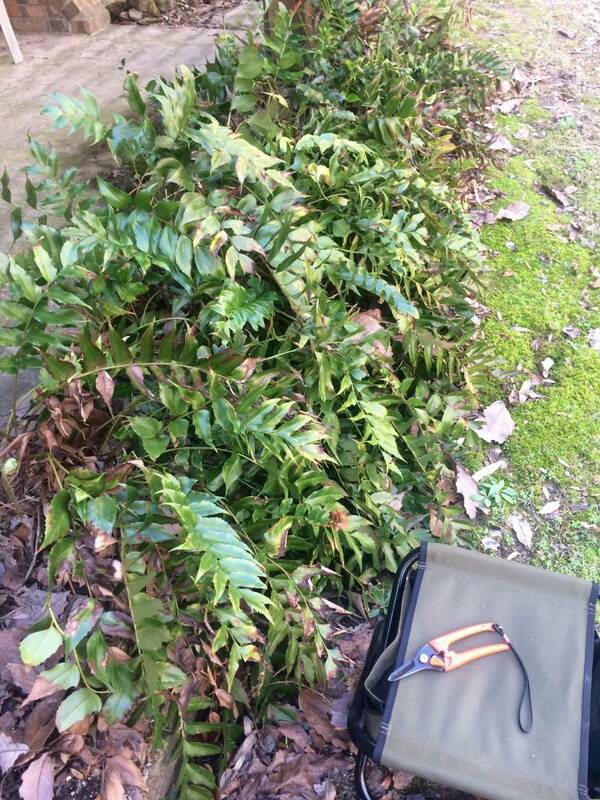 This entry was posted in Ferns, Perennials and tagged evergreen ferns, maintenance of fern beds, perennial ferns on February 20, 2017 by Kris Blevons. 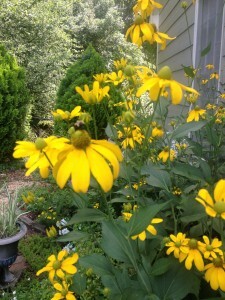 Last year about this time I wrote about the Million Pollinator Garden Challenge. 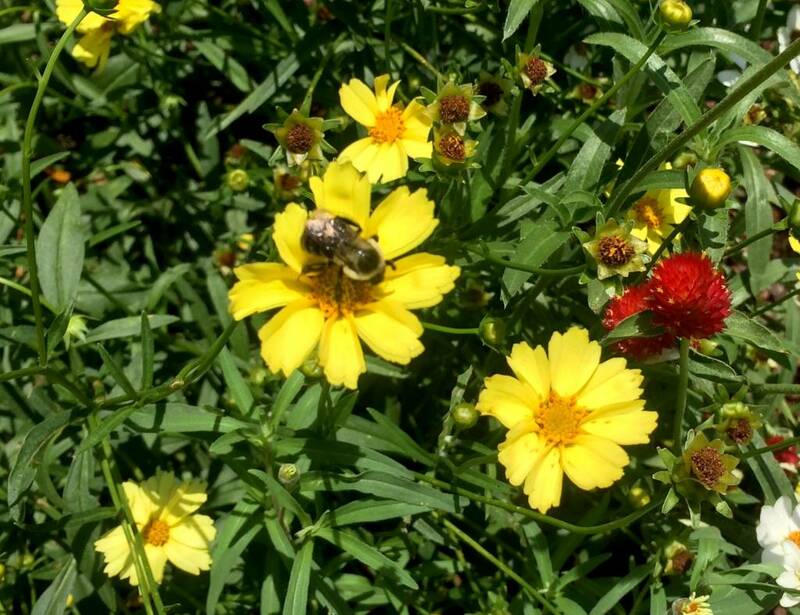 I hope at least some of you are also participating, either formally or simply by planting some nectar rich flowers and providing for wildlife in your landscape. 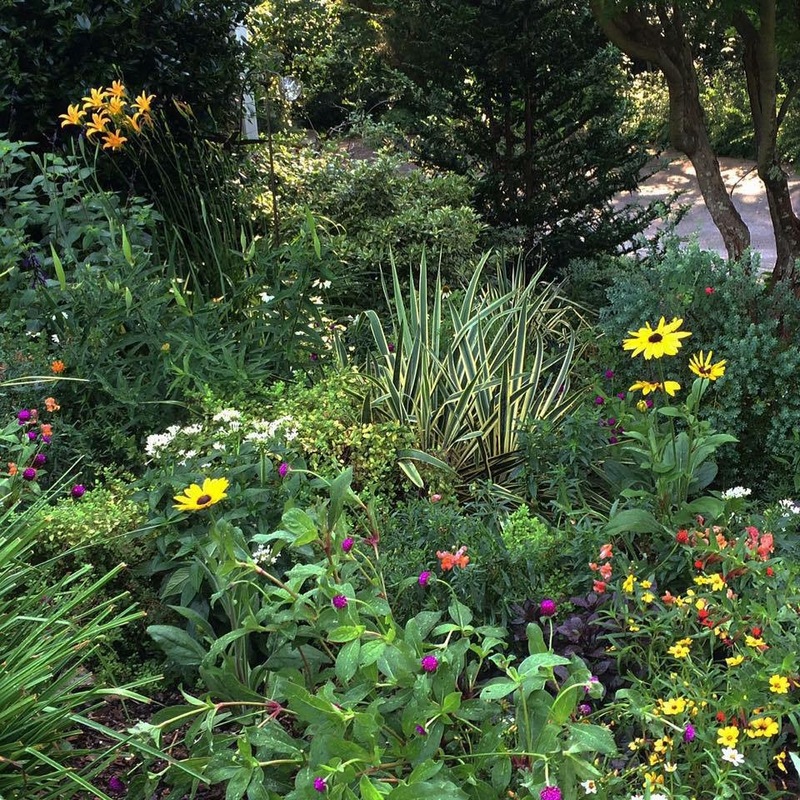 High summer here in Birmingham brings sizzling heat and lots of it, along with the welcome abundance of life in pollinator gardens. 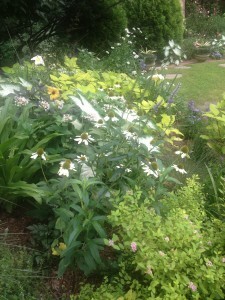 In mine the perennial summer phlox, coreopsis, coneflowers, butterfly weed, salvias, rudbeckias, and daylilys are abuzz. 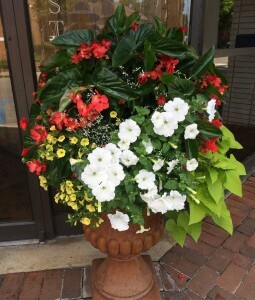 Annuals, especially those in the sun, are also capturing bee, butterfly and hummingbird attention, and I try to plant a variety for each in my sunniest beds. 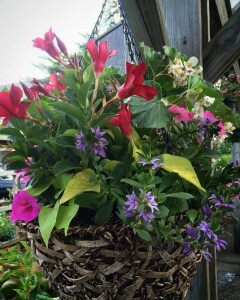 Angelonia, gomphrena, zinnias, batface cuphea, Mexican heather, purslane, and more jockey for space. 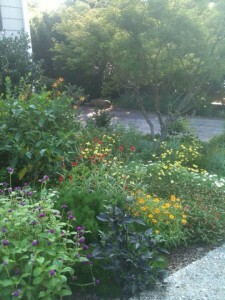 I take walks through my landscape early in the morning before leaving for work (And the heat builds. 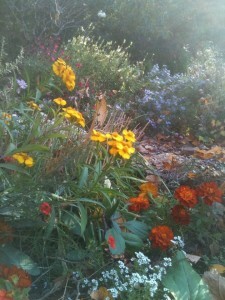 ), deadheading, weeding, and simply admiring too. This is the tail end of daylily season, and on summer evenings I pull off unsightly yellow leaves, faded blooms that might be hanging on, and then cut spent scapes to the ground. 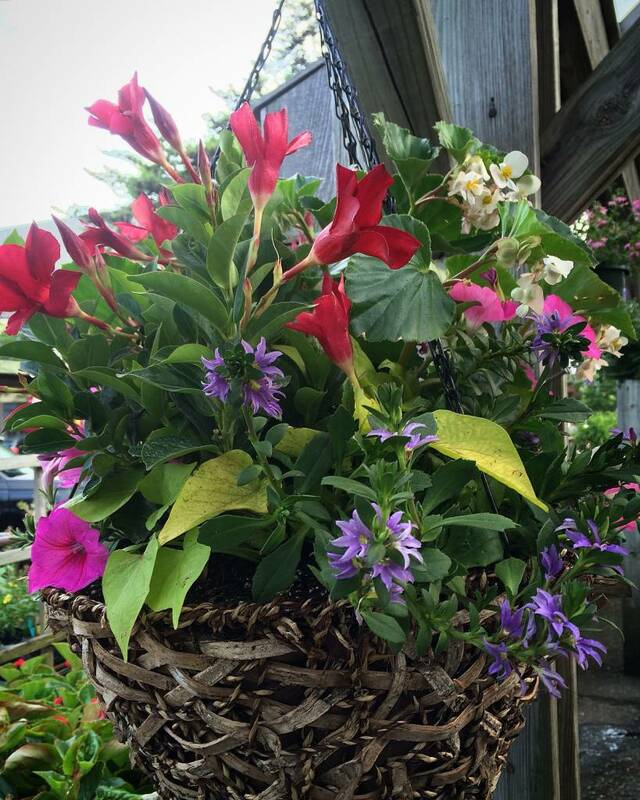 After they’re completely through blooming, if foliage looks rough, I’ll grab a handful, twist it, and cut it completely off. It will reflush with more sightly looking leaves lasting until the end of the season. 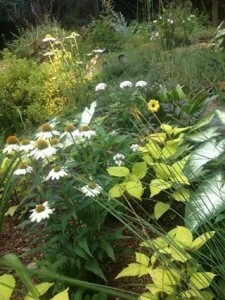 Remember, you see foliage more of the year than flowers on most perennials. 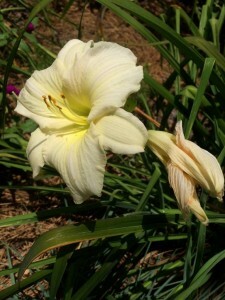 Plan for that when deciding where to plant them or if you’re dividing and/or moving them. 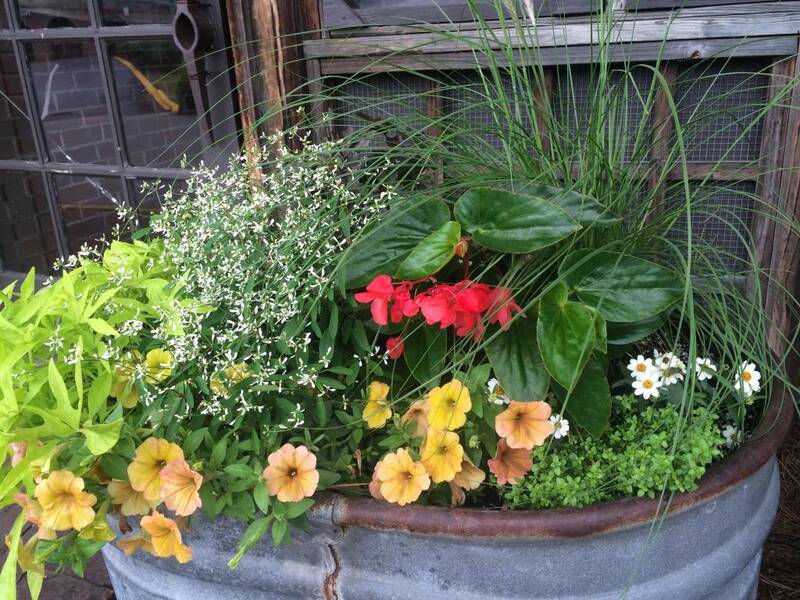 If it’s been very dry, the early morning hours are spent watering any plants that look wilted. If they’re left without water too often, the stress will weaken them and they’ll be more susceptible to disease and insect attacks. 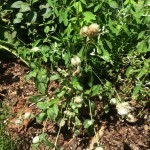 I’ve noticed some of the small white gomphrena that I planted quite late are struggling. I don’t think they’re getting enough sun, and they’ve gotten parched more than a few times. I’ll be keeping an eye on them. 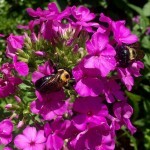 The summer phlox and coreopsis are in full bloom and the bees love them. 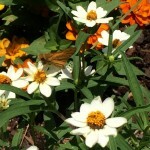 I watch tiny skipper butterflys light on the coreopsis; they move so fast! 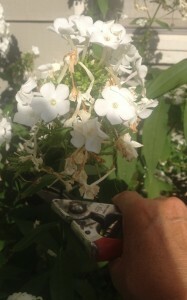 When these two play out I’ll cut the faded flowers off the phlox and wait for a second, smaller display. The coreopsis will be sheared back since there are too many small flowers and not enough hours in the day to deadhead each one. 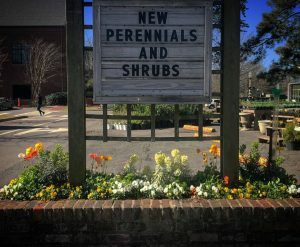 As with most summer blooming perennials, I’ll cut stems back completely to neaten the garden and give late blooming plants room to shine when the weather finally cools. 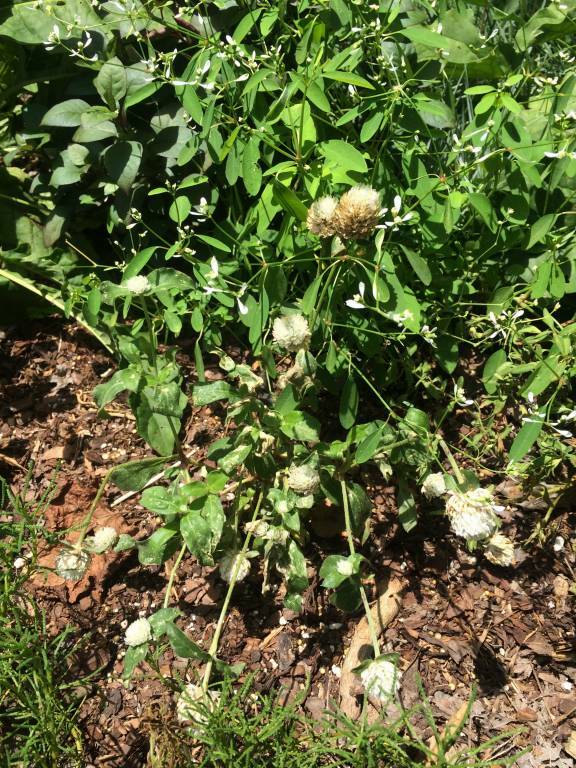 Honestly, though, it’s really too hot to do much more than water, deadhead, and pull opportunistic weeds that seem to come out of nowhere. Even as I water I’m dreaming of my vacation north to see family and friends. 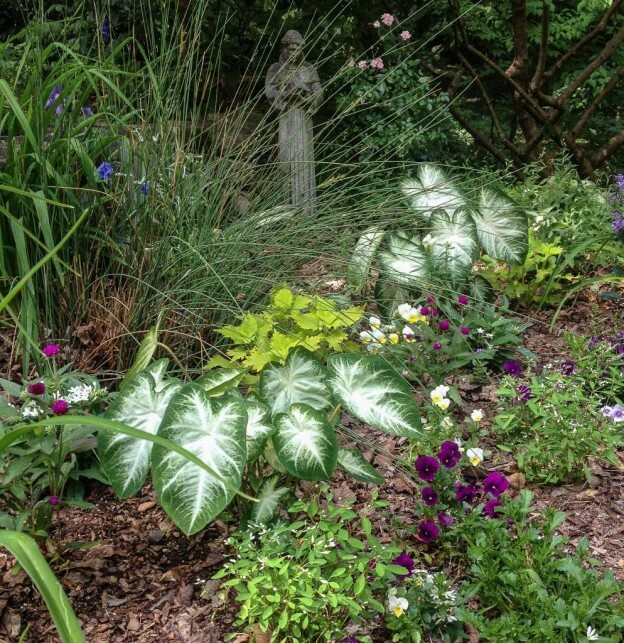 I know my garden will be here when I return, grown even more lush with high summer’s heat and, hopefully enough rain too. 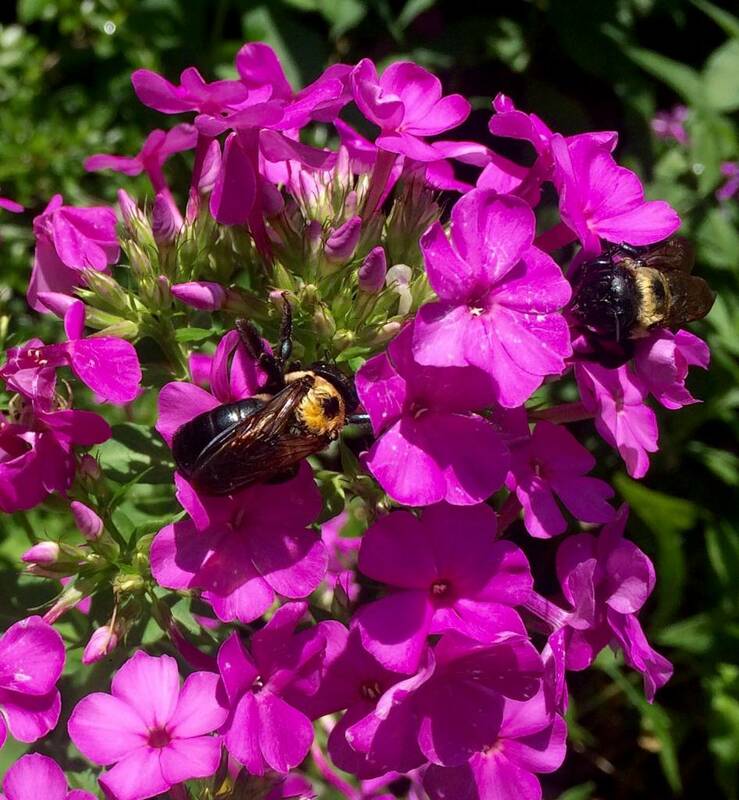 This entry was posted in Annuals, Perennials, Pollinator Gardening, Summer and tagged high summer in the garden, million pollinator garden network, pollinator garden, summer phlox, summer plants on July 10, 2016 by Kris Blevons. I like to feel I’m doing a good job of gardening to attract pollinators. 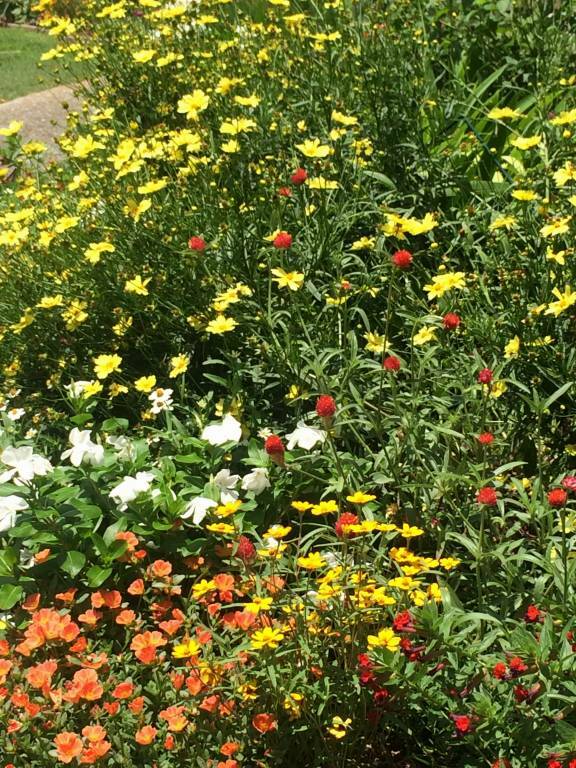 At any rate, my home garden and the ‘Better Late Than Never’ garden across the street from Oak Street Garden Shop seem to have lots of bees, hummingbirds, and butterflies, so I must be doing something right, right??!!?? 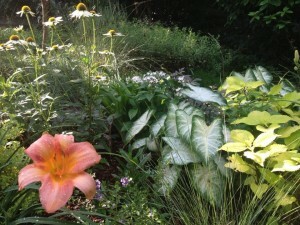 Your home and yard, garden, landscape, whatever you call the space that surrounds your home, is your personal ecosystem. 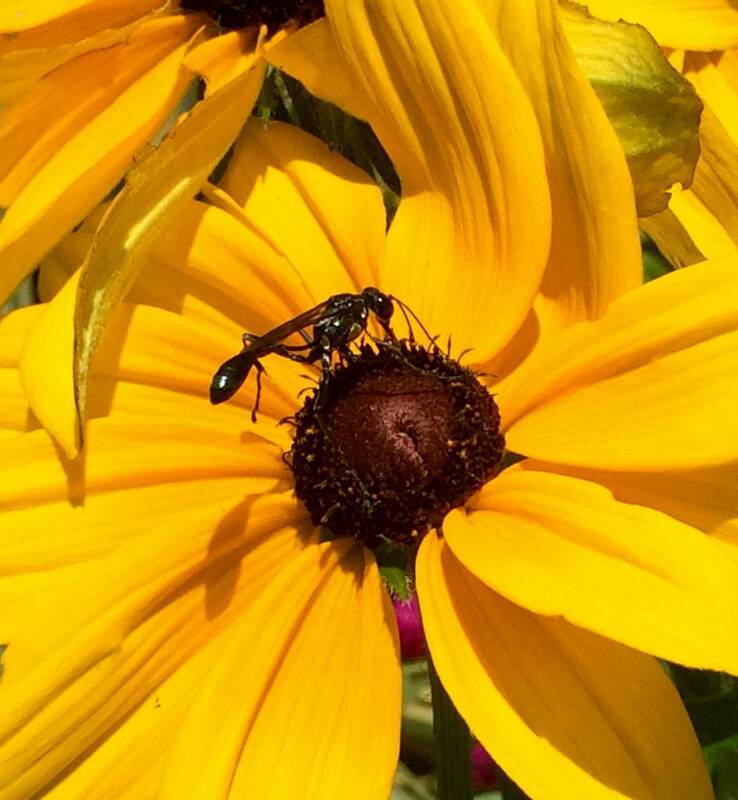 The health of it and the pollinators that visit it depend on how you build your soil, what you plant, and how you choose to maintain it. 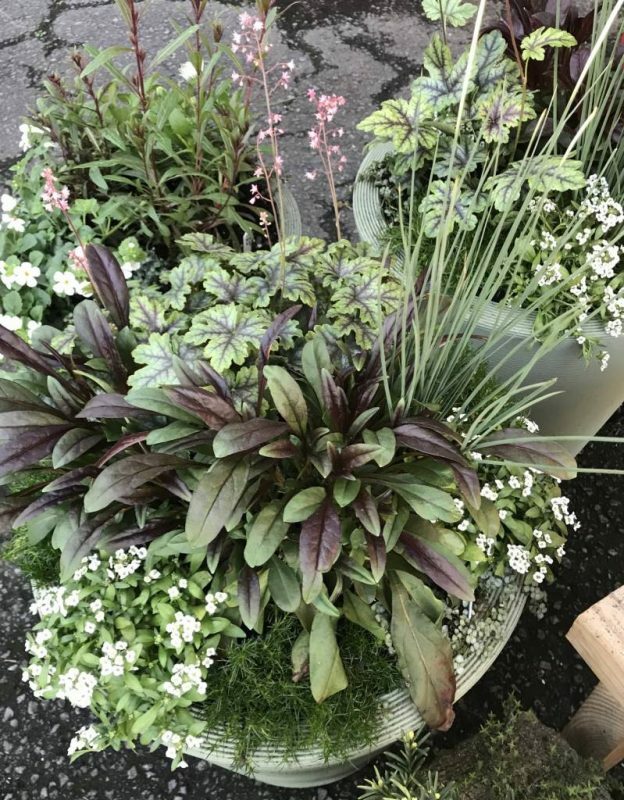 So my choices have been to try to have as diverse a plant pallette as possible (I admit, I’m a plantaholic. 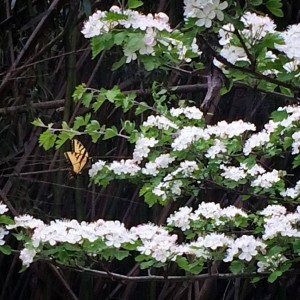 Who knew that would play right into gardening for pollinators?) and to eliminate pesticide use almost entirely. I’m gratified when I hear of others that are trying to do the same thing. 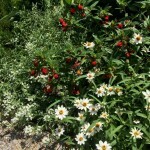 I use organic soil amendments like PlantTone and Annie Haven’s Moo Poo Tea, have learned to live with a few holes in leaves, let the ladybugs eat aphids (If they really get too bad, I wash them off with some soapy water. ), and practice patience, knowing that most of the time an infestation of insects doesn’t last forever. I take great joy in bopping Japanese beetles off of my roses into a bucket of soapy water early in the morning when they’re most sluggish. I know each year they’ll be back – it’s just part of the garden’s cycle. If you feel you have a large problem and must spray, start with the least toxic form of chemical control, and understand that even products labeled organic can be harmful to good bugs as well as bad. ***Always read the label and follow directions carefully! I’ve learned that planting large swaths of color will attract bees, and that they prefer blue, purple, white, and yellow. I’ve learned to grow a wide variety of plants, including plants with a scent, herbs in particular. 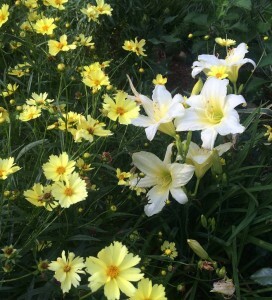 I’ve learned that while double blooms on flowers are attractive to us, they’re not especially useful for pollinators, and that they much prefer single, simple blooms. 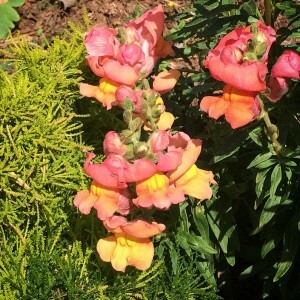 I’ve learned that flowers that come back from seed that drops in the garden (zinnias, sunflowers, bachelor buttons, larkspur to name a few), perennials, and any of our native shrubs, trees, and wildflowers are preferable also. 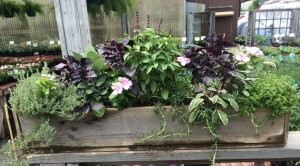 Most importantly, I’ve learned that it’s not that hard, and actually quite a bit easier, to garden naturally. I have some clover in my grass. And you know what? It’s okay, because I have bees foraging it. Somewhere there’s some great honey in the making! 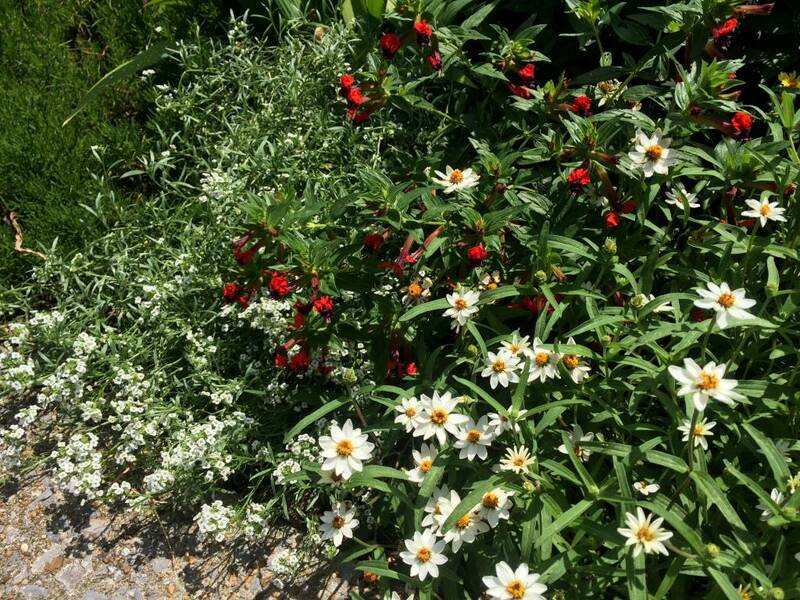 These lists are by no means exhaustive, but are meant to be a starting point for your pollinator garden. 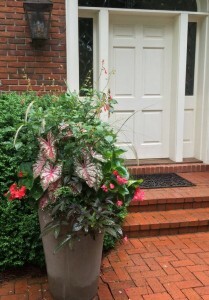 Some of these plants are best planted in the fall, while others are more heat tolerant. 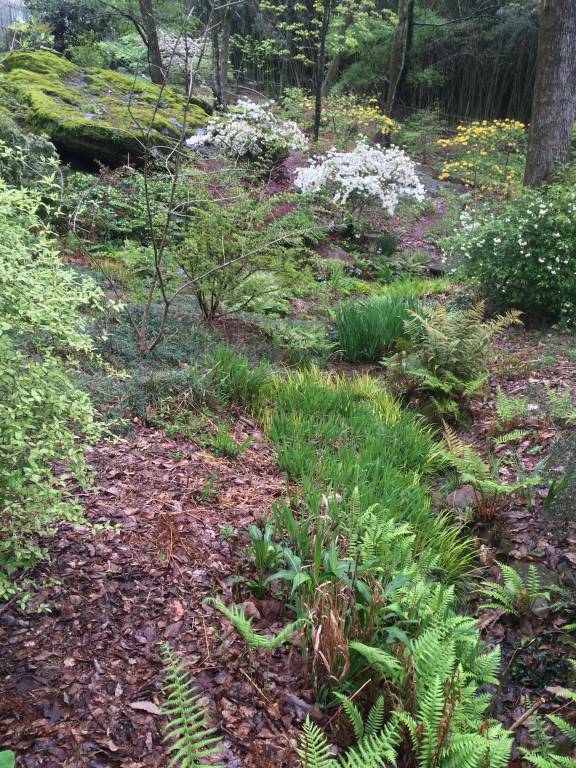 *** Alabama’s watersheds, rich in animal and plant life, absorb the brunt of chemical and fertilizer runoff from homeowner and commercial pesticide and fertilizer application. 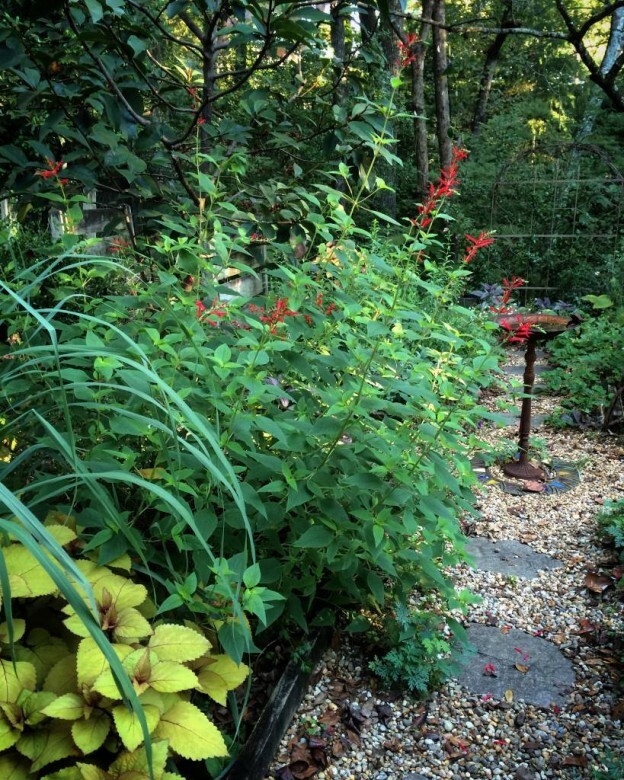 Be mindful that what you (and your neighbors) put in the landscape can adversely affect these areas and the life in them. 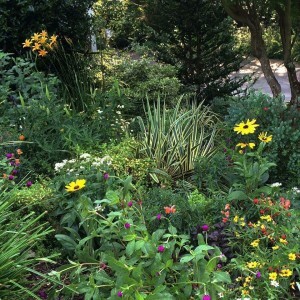 This entry was posted in community garden, Flowers, Garden Preparation, Herbs, Native plants, Nature, Perennials, Planting Tips, Pollinator Gardening, Soil Amendment and tagged better late than never garden, butterfly gardening, flowers for bees, flowers to attract hummingbirds, gardening naturally, pollinator garden on March 27, 2016 by Kris Blevons. 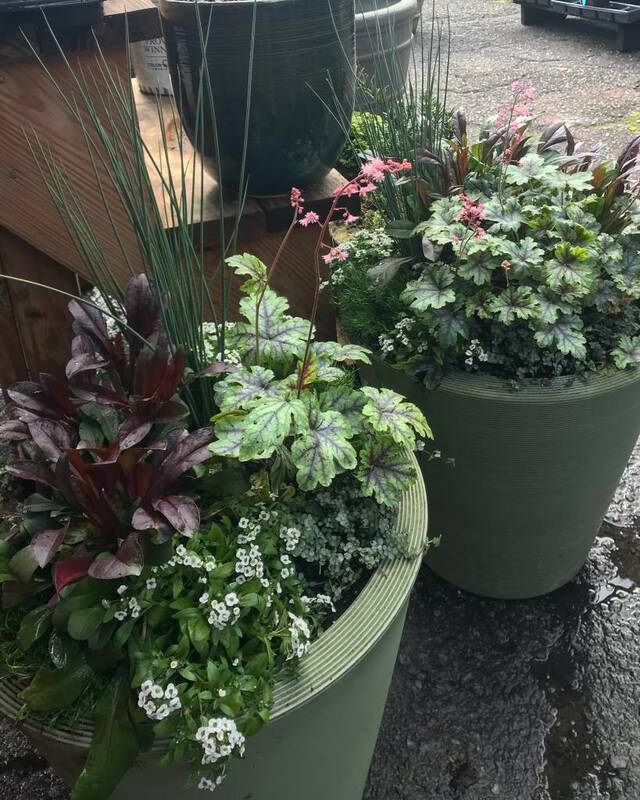 First Shrubbery Shipment of the Spring Has Arrived! 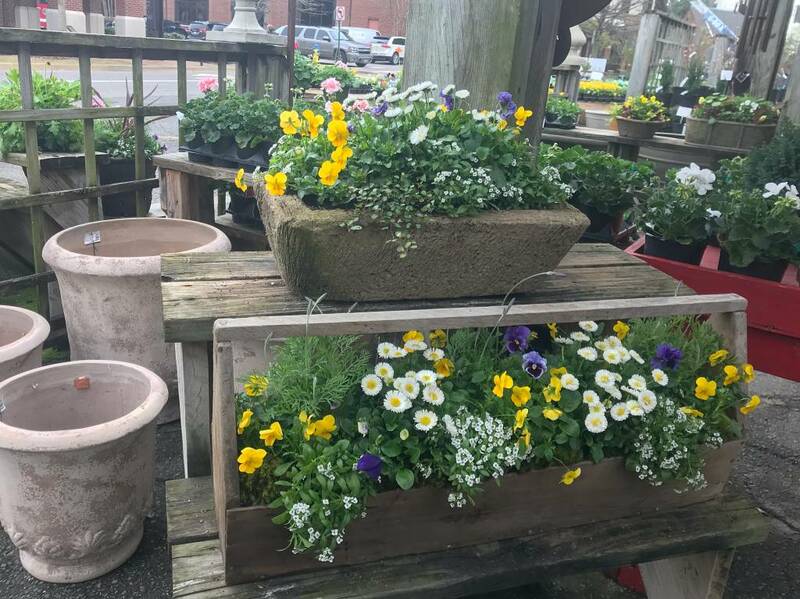 Last week our first spring shipment arrived, this from a local grower in Shelby County. We can always count on them to supply us with healthy plants, all of which are chosen for our area. This shipment has treasures that you might not notice on first glance. Because of our space limitations we carry small quantities of plants we think are worthy of your purchase. 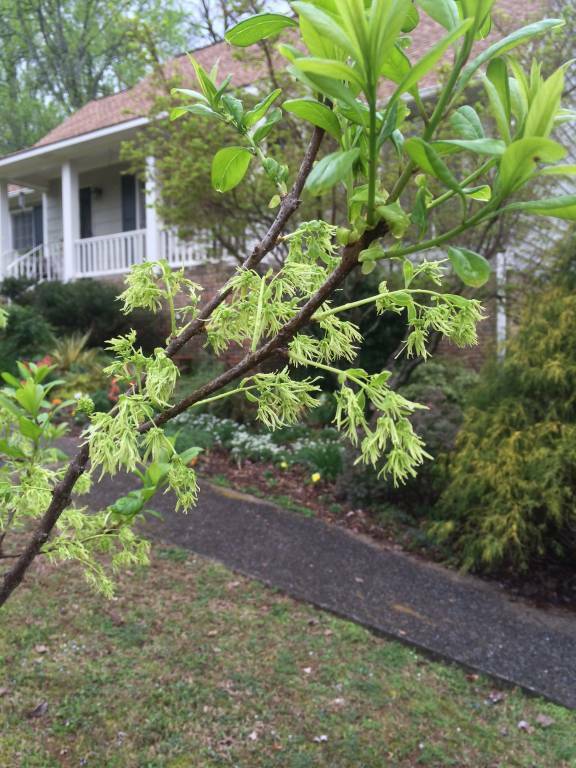 These include our native fringe tree, Chionathus virginicus, a beautiful understory tree that everyone comments on when it blooms in April. The common name comes from the clouds of white, fringe-like blooms that hang from its branches, and many believe it rivals dogwood trees for beauty. Its size is variable, ranging from 12′-20′ and as wide, and the perfect spot would be in full to partial sun. This would also make a wonderful remembrance gift. 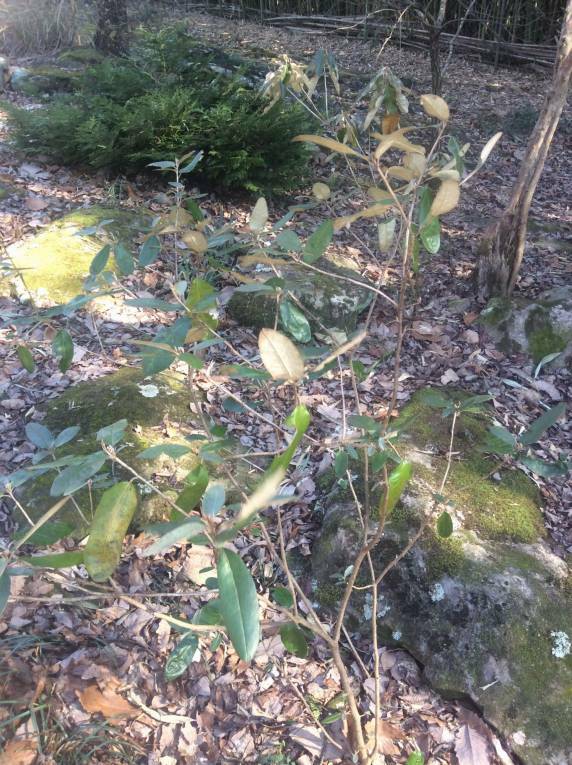 Osmanthus fragrans, the fragrant tea olive, is a large shrub that is unassuming until its sweet fragrance gives it away in the late fall, though there are also some flowers in the spring too. 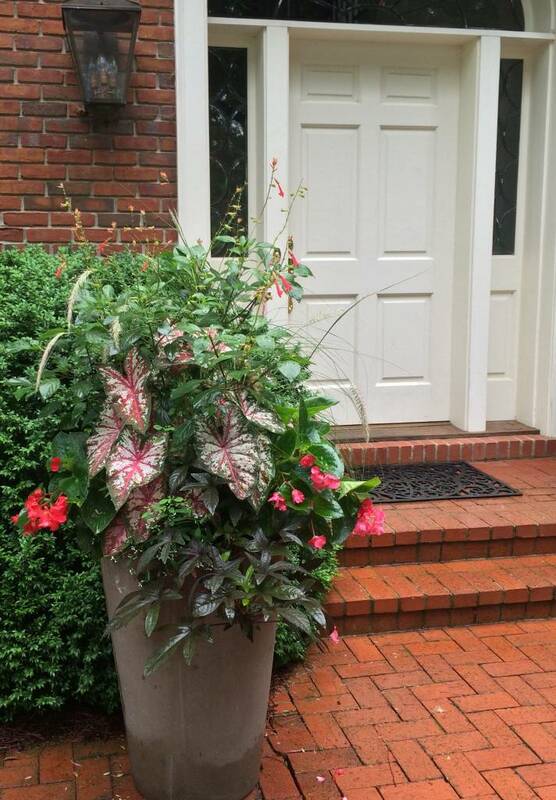 It’s very drought tolerant, but it does need a protected spot as it is as the edge of its cold hardiness here in Birmingham. Most importantly, plant it where you’ll be able to enjoy its unbelievable fragrance! If your landscape has room for any native deciduous azaleas, we also have these gorgeous harbingers of spring. 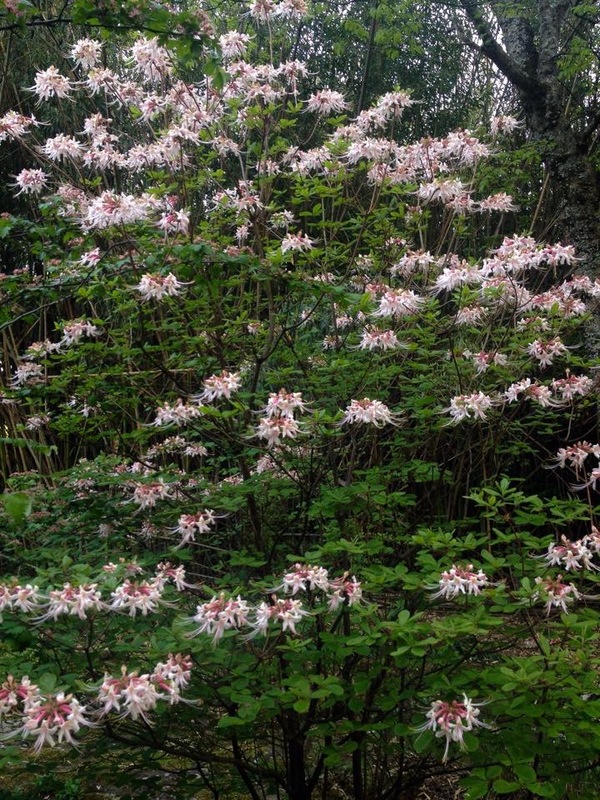 Unlike the usual azaleas you might be familiar with, these bloom before they leaf out and the blooms seem to float in midair. One of the most beautiful is the Florida flame azalea, and we have a selection of it, Rhododendron austrinum, “Escatawpa’. 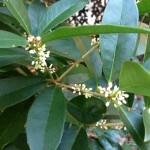 It’s a vigorous grower with fragrant yellow to orange blooms. 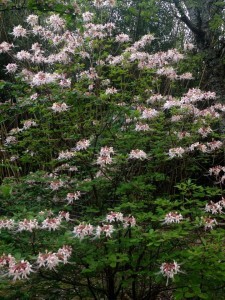 In addition, we have the soft pink flowering and very fragrant native azalea, Rhododendron canescens, also known as the Piedmont or Honeysuckle azalea. 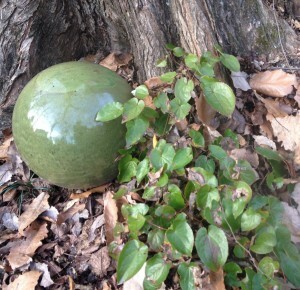 Perhaps you’ve seen large specimens up to 10′ tall blooming in gardens here in the early spring and not known what it was. Another, Rhododendron ‘Spring Sensation’, is one bred for heat and humidity tolerance and large blooms. All native azaleas do well here if given filtered shade, though they need enough sun to set buds, so don’t site them in deep shade. Keep an eye on them their first summer, supplementing water if we go through dry spells, and enjoy the beautiful show each spring. A native deciduous shrub (meaning it loses its leaves in the winter) available now that does well in the garden and in containers is our native Virginia sweetspire, Itea virginica. 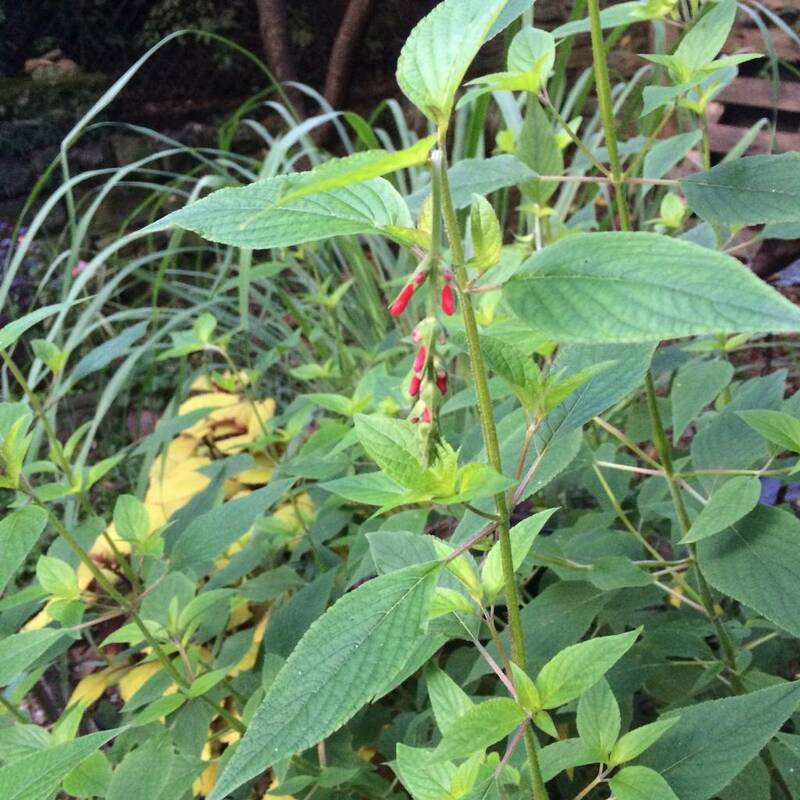 We have a selection called ‘Henry’s Garnet’, grown for its profuse and fragrant blooms, beautiful red fall foliage, and tolerance of dry or damp soils once established. 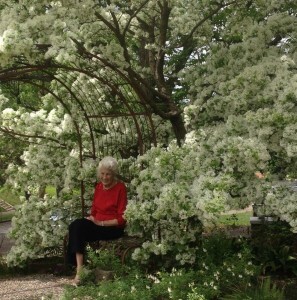 It’s truly a wonderl in any garden, adding beauty in each season. 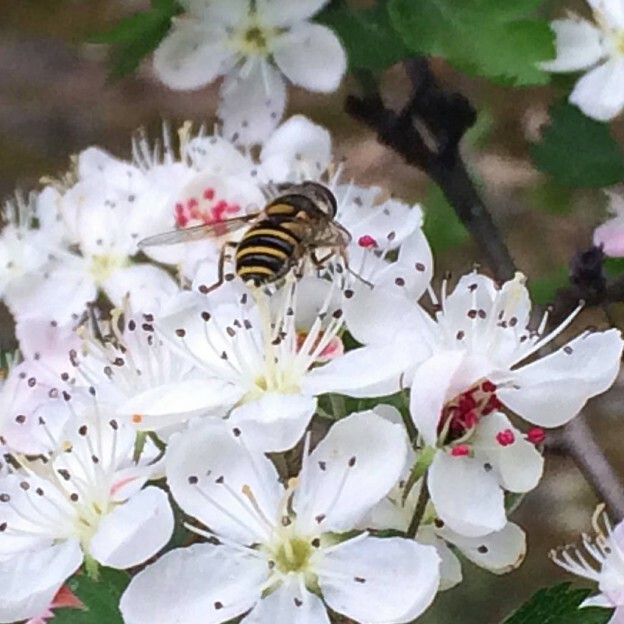 Spiraea is a deciduous shrub that many ask about when it’s in bloom. Its claim to fame has to be all the tiny blooms creating a beautiful show along arching stems. Selections we have now are ‘Renaissance’, and a dwarf selection, ‘Tor’. 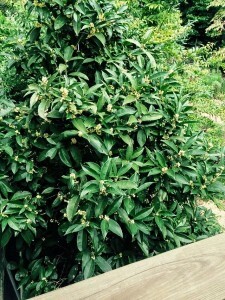 An old fashioned shrub, pearlbush, ‘Exochorda’, gets its name by the round pearl like buds that open to white flowers. The selection we have is called ‘Blizzard’, and for good reason; it’s reputed to have a blizzard of large, frilly, white flowers at its height of bloom. 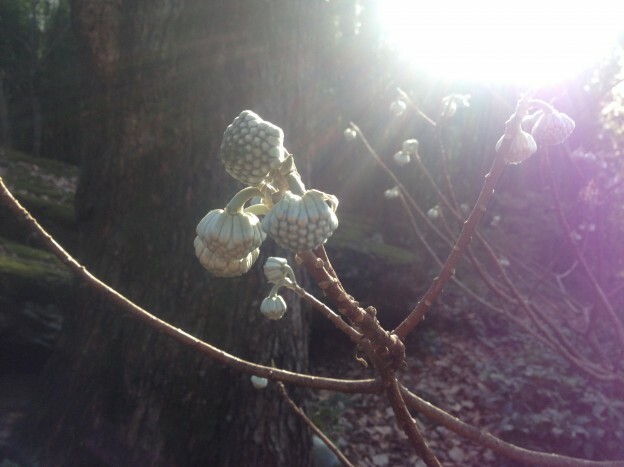 Spiraea and pearlbush are known primarily for their spring interest, and they are worth waiting for each year! 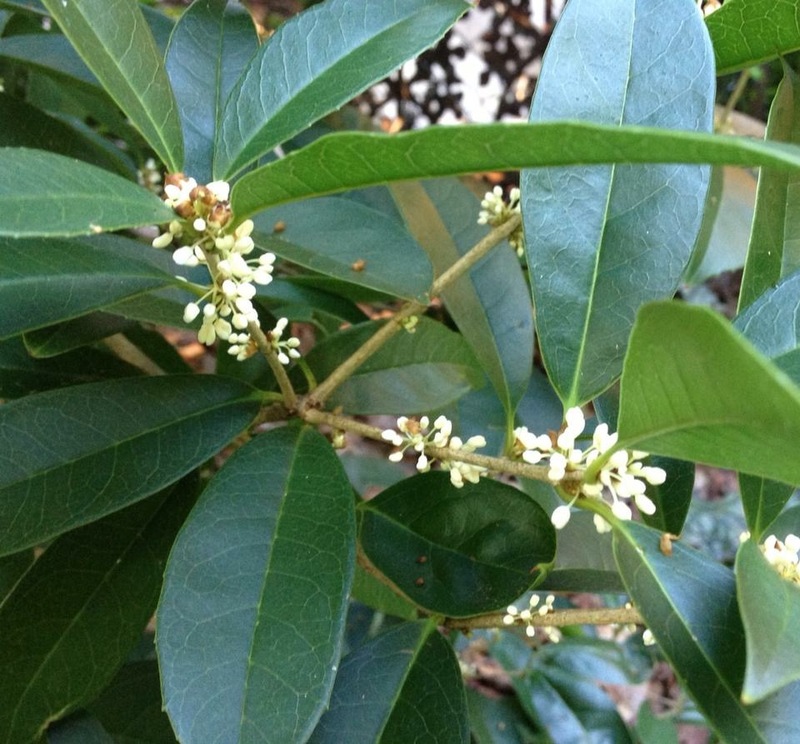 Finally, a few more plants you might be interested in include bay laurel, Laurel nobilis, for edible bay leaves if you’re a cook, and a deciduous vine called Schizophragma. 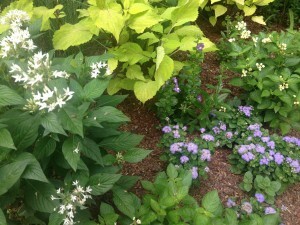 Its common name of climbing hydrangea (though it’s not a true hydrangea) describes its hydrangea-like blooms. The selection we have is ‘Rose Sensation’. 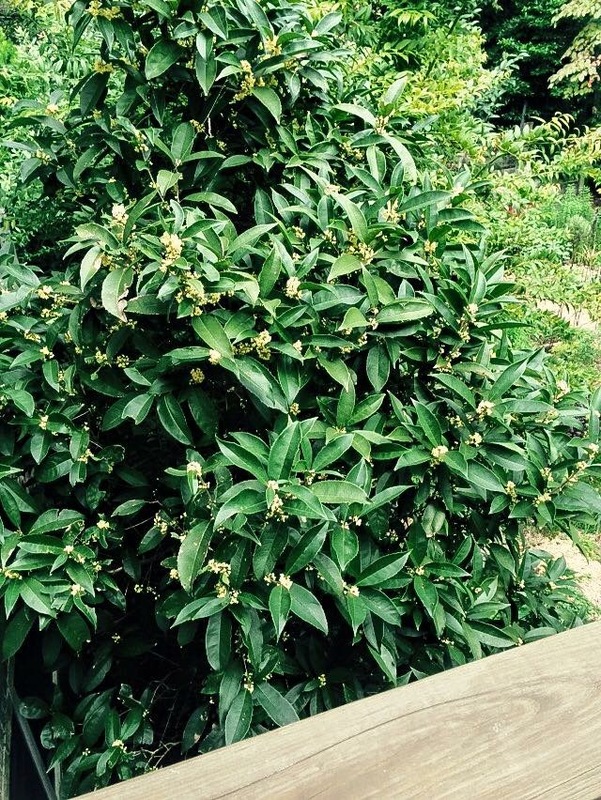 Another vine of note we have now is Confederate Jasmine, Trachelospermum jasminoides. 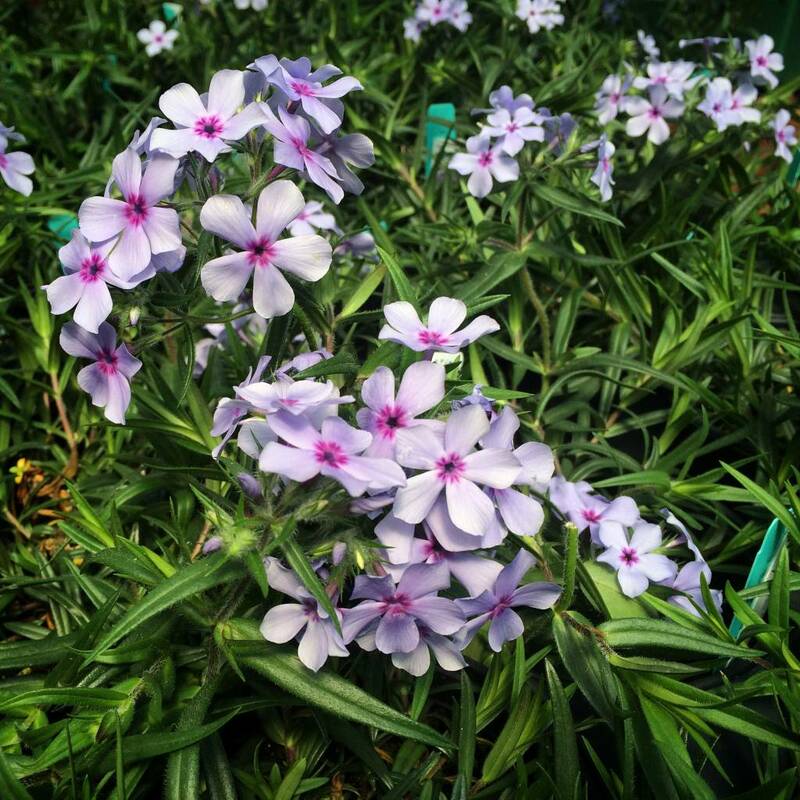 The selection we carry is a more cold hardy variety called ‘Madison’. 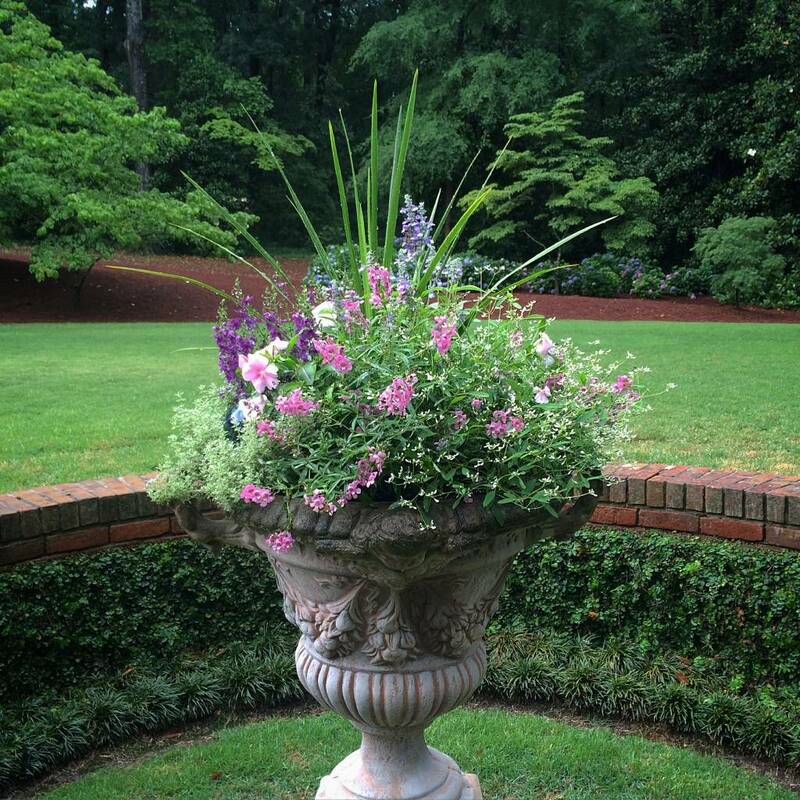 These shiny green leaved vines with fragrant white blooms are a staple in southern gardens. 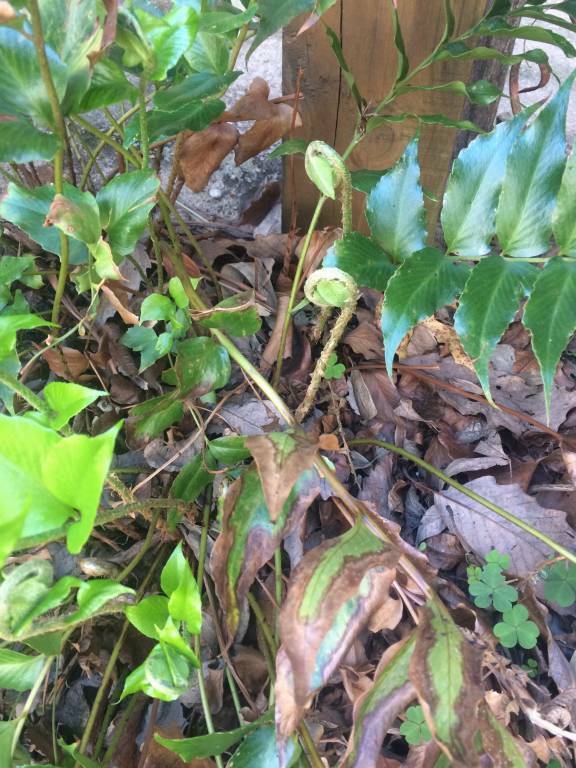 Keep in mind that even though it’s listed as an evergreen vine, it can get knocked back by particularly hard winters. 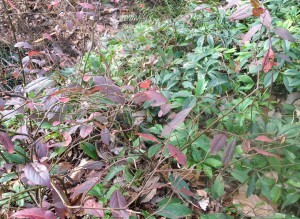 Finally, we’ve gotten in a few evergreens and a pretty Deutzia called ‘Nikko’, a small mounding deciduous spring bloomer. 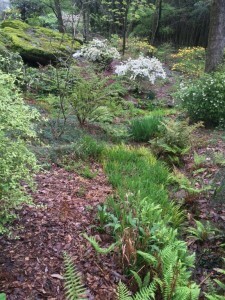 Of course, this is just the beginning, as the nursery will begin to fill quickly with the approach of spring. Stop in. There may be a treasure waiting just for you! This entry was posted in Perennials, Tree/Shrubs, Vines and tagged deciduous azalea, fringe tree, native azalea, native trees and shrubs, virginia sweetspire on February 20, 2016 by Kris Blevons. 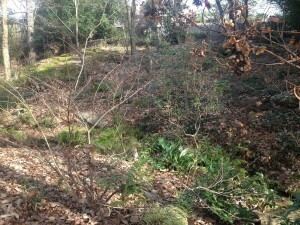 The garden looked hunkered down and frozen the other day, and well it should, since 10 degrees was a mite chilly for Birmingham, Alabama. 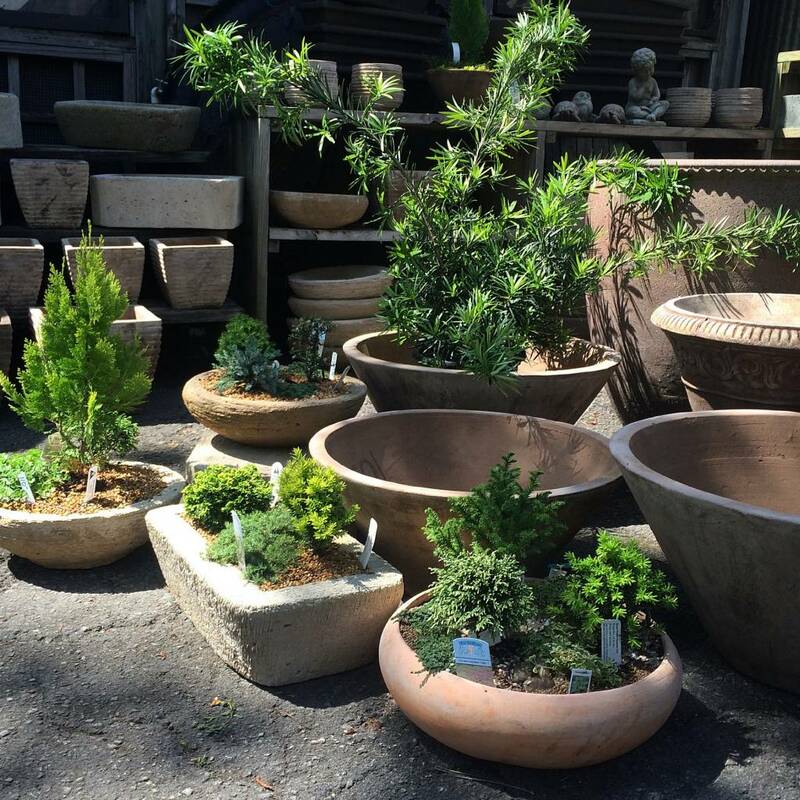 While gardeners in northern climes take the winter off, perusing catalogues and dreaming of a new garden season still months away, usually we in the south, like it or not, don’t have any real down time. I seem to spend much of mine walking through the garden and simply observing and thinking about what needs doing, and, when the temperatures drop down below freezing, I’m more than happy to stay inside. For example, I’ve been thinking on and off for over a year now about moving one of the shrub roses from the front bed to the side of the driveway but haven’t quite gotten past the thinking stage yet. I’ve become much more relaxed about things; everything will get done in its own time. Don’t sweat the small stuff, right? Here’s a bit from a post written last winter with some additional notes about what differences a year can make. 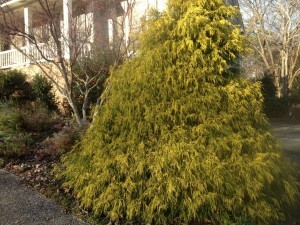 Chamaecyparis obtusa ‘Golden Mop’ calls attention to itself out front with some yellow brightness of its own, anchoring the end of the front bed. It has loved this hot, sunny spot, and I appreciate being able to clip it for my holiday decorations. What a beautiful workhorse in the garden! 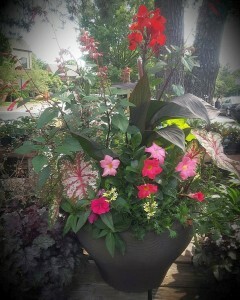 I purchased it (and most of my shrubs and trees) in small pots and have let them grow into their spaces. 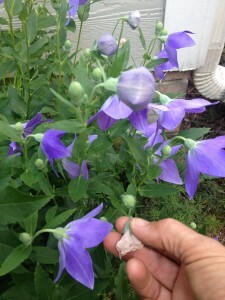 The veronica ‘Georgia Blue’, a white pass-along dianthus, and poppies seem happy, as does the catmint, ‘Walker’s Low’. The beautiful veronica will be covered with tiny blue flowers in late January into February, just as the poppies begin to fatten up and the violas begin to show more color. 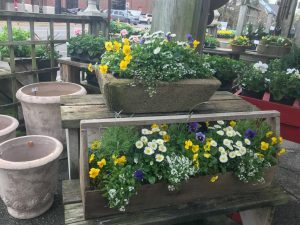 If you haven’t planted poppies, pansies, violas, the ‘Georgia Blue’ veronica or candytuft yet, it’s not too late to find a few spots for some. 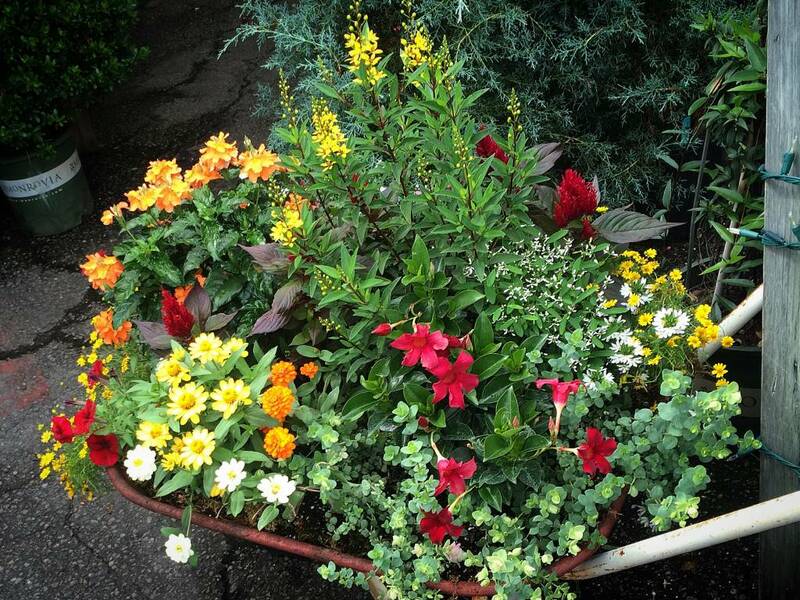 They’ll add some extra and welcome color in your yard this spring. This bed will look much different in future weeks and months, but now, in the midst of winter, things are quiet…I must remember this is the season for patience. 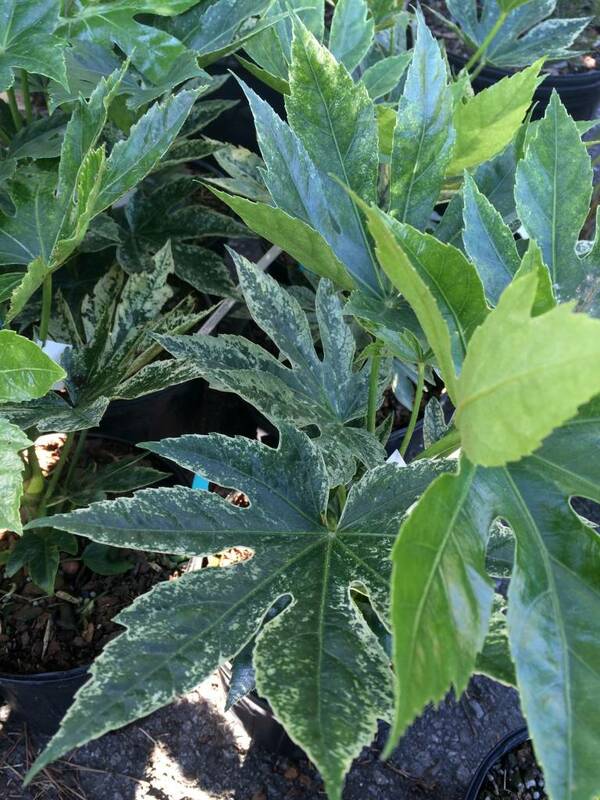 I walk down another level and there’s one of many small Alabama crotons, looking a bit bedraggled, still with a few silver backed orange leaves. 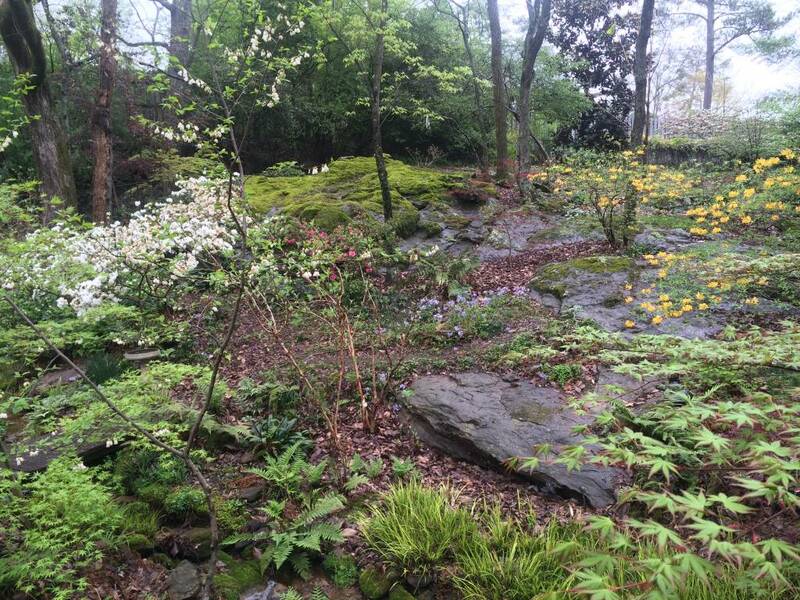 The crotons love this part of my garden – thankfully, since it’s on a rocky slope with great drainage that they prefer. 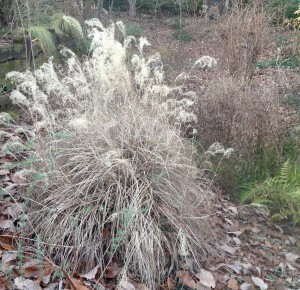 Farther on, the plumes of a miscanthus show off in the afternoon light. This year, 2015, it looks so sad I won’t hesitate cutting it back next month. This will also keep all those seeds from wanting to sprout here and there. My Midwestern soul loves grasses… but not everywhere! 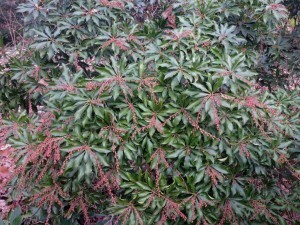 I notice this year that the pieris is fat and full of buds – the cold doesn’t seem to have affected it at all, at least I hope it hasn’t. It may be in a favorable microclimate – warmed by the rock outcrop just behind it, and the water below. 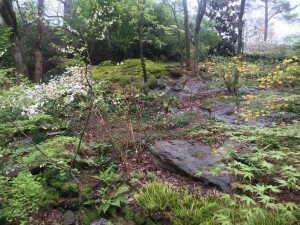 I make my way across the water and toward the rocks where an epimedium resides in the shelter and shade of a large elm. 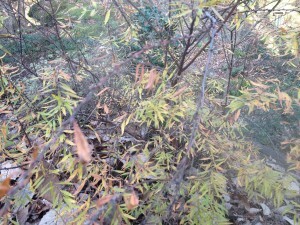 I’ll be trimming it’s tattered winter foliage soon in anticipation of the dainty orange flowers that will appear early spring. There is no procrastinating with epimedium; if I wait too long to clean up those tattered leaves, I risk cutting the delicate stems the flowers arise on. These small lessons are often learned by doing the wrong thing at least once. 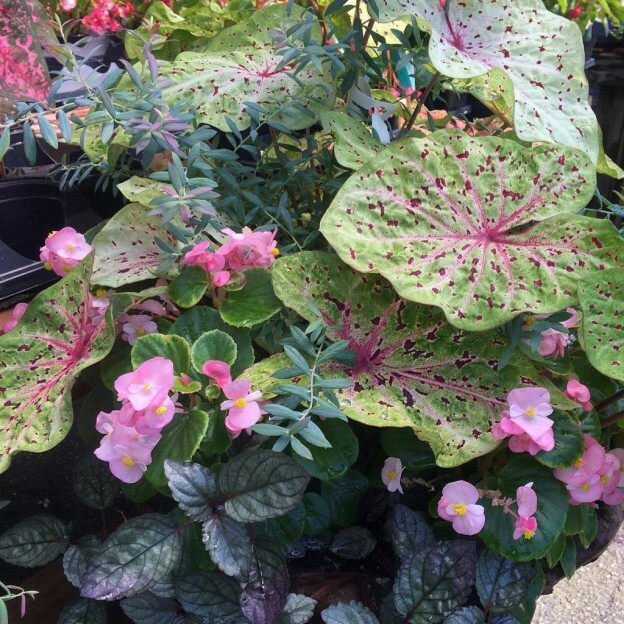 I love all the different epimediums I’ve amassed over the years. 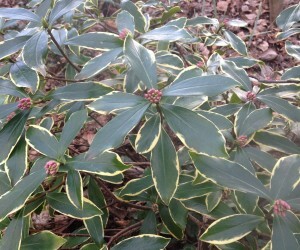 They are slow growing, tough shade groundcovers – some evergreen, some not, and all very beautiful, even without flowers! 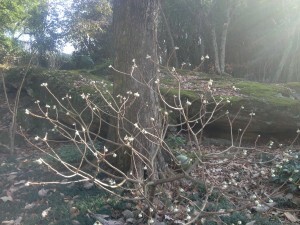 One shrub I never prune but let have it’s way, and that always blooms in the winter is the Edgeworthia chrysantha, or paper bush. I see the beautiful buds that have been getting larger all fall; soon they’ll begin to open and their incredible scent will fill the garden. It’s a true gem, holding interest in all the seasons, from it’s long lasting pretty buds to fragrant blooms, interesting bark, and big, bold leaves. 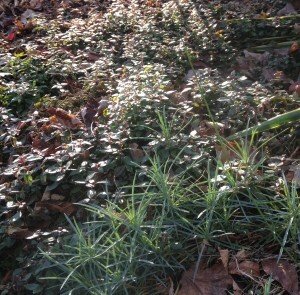 I need to end this post soon…Oh, but here, coming up through fallen leaves, is the Cardamine diphylla. 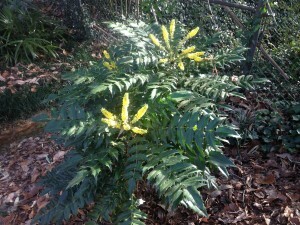 I have this native in many spots under the shade of large trees. It will sport pretty white blooms on tall stems in late spring, but it’s the winter when the foliage is at it’s prettiest. By summer it will have retreated below ground once again. 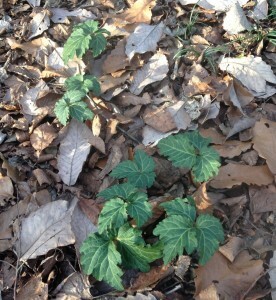 This winter it’s spread even more, and the pretty green foliage really stands out against the brown leaves beneath it. 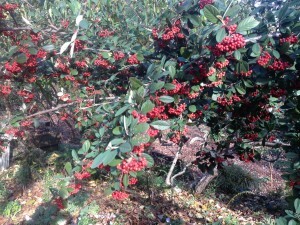 Parney’s clusterberry cotoneaster…the cedar wax wings will devour these berries in another few weeks! 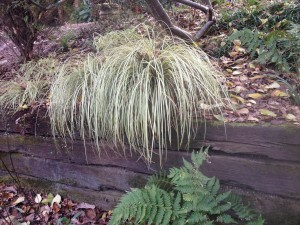 Carex is another favorite, and here is Carex ‘Evergold’, spilling from a planter. Look how bright is is in the shade of a Cotoneaster lacteus – ‘Parney’s Clusterberry. Finally, the daphne odora’s pink buds are getting larger, and soon they’ll open, adding their incredible scent to the whole back garden. 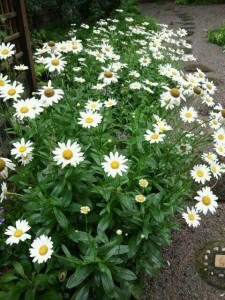 This is one that I leave well alone – it needs perfect drainage, and on this slope it seems to be happy. Too much coddling and they are prone to up and dying. So far I’ve been lucky with this one. The light is beginning to fade and there’s a definite chill in the air; it’s time to go in. There will certainly be more ups and downs with our weather this winter – that’s a given. Finally, though, temperatures will gradually begin to rise as we make our way toward spring, and each day there will be more to see. I’m ready. 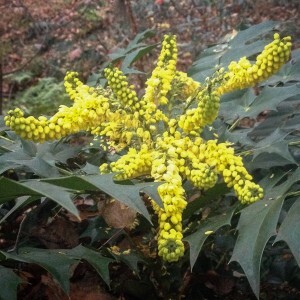 This entry was posted in Native plants, Perennials, Tree/Shrubs, Winter and tagged alabama croton, carex 'Evergold', chamaecyparis obtusa 'Golden Mop', dianthus, epimedium, iberis candytuft, miscanthus, spiraea 'Ogon', Veronica 'Georgia Blue', winter shrubs, woodland garden in winter on January 13, 2015 by Kris Blevons.